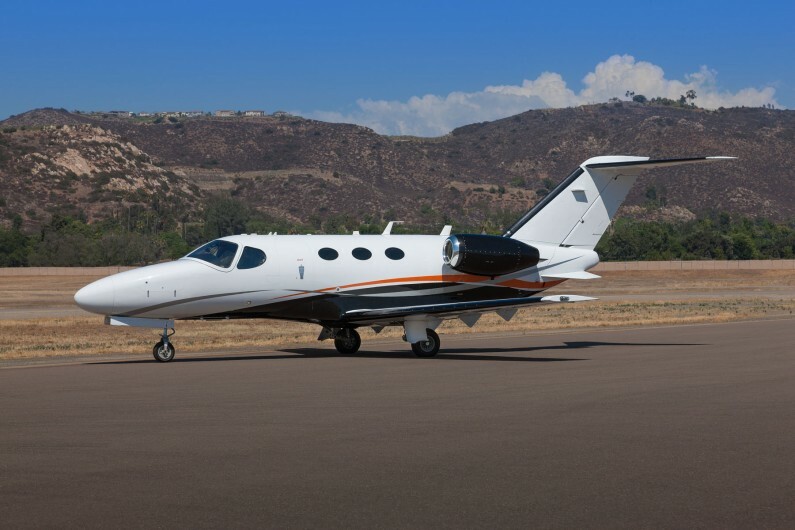 The Citation Mustang is designed for flights of up to 1000 miles, comfortably accommodating up to four passengers and their luggage. 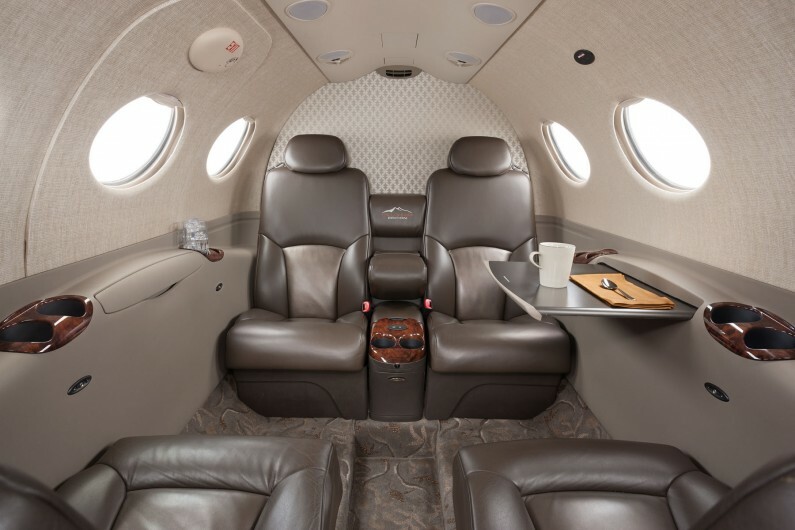 Desert Jet’s Citation Mustang features a beautiful new interior with warm taupe premium leather seats and handmade patterned carpet. The Mustang is perfect for flights from San Diego or Palm Springs to destinations such as San Francisco, Carmel, Las Vegas and Scottsdale. Winter enthusiasts will enjoy ski trips to Aspen and sun worshippers can quickly jet to Cabo San Lucas. The Mustang has very competitive range capability, and can takeoff from Palm Springs, California at maximum takeoff weight, fly at high speed cruise and can reach destinations such as Edmonton or Calgary in British Columbia; Houston, Texas; or even Mexico City, Mexico, all with a reserve fuel range of 100 miles! The cabin length measures 9 feet 9 inches, providing plenty of room to breathe and 25 degrees of tilt in the aft seats to nap in. A side facing lavatory is concealed with a privacy curtain, while small forward cabinets provide storage for ice and beverages. The cabin has forward and aft, 12 volt DC power outlets, stowable tables on each side, cupholders, and an aft storage compartment between the seats that houses folding armrests and nice storage compartments. The Citation Mustang incorporates a surprising amount of baggage area including a ski tube capable of storing 191cm skis! The total baggage area allows for 620 pounds of baggage and 57 cubic feet of storage area. The side facing lavatory also has the capability to be easily converted into a supplemental baggage area with a removable cargo net. The Citation Mustang is certified for single pilot operation, and incorporates the Garmin G1000 avionics package. Earlier this year, Cessna rolled the 300th Citation Mustang out of the factory. Cessna decided to celebrate with the Mustang High Sierra Edition, offering incredible interior packages, which contained handmade carpet among the many other options.